How do you have to manage waste biological materials generated by your activities—maybe from agricultural or biotech production, or maybe from your onsite clinic or the healthcare facility you run? Worker safety and transportation rules will apply to handling, and environmental protection rules to releases and disposal. But the main regulatory focus is provided by waste management requirements. If the wastes posed only physical or chemical hazards, you should know to consider requirements imposed by the Resource Conservation and Recovery Act (RCRA) and its state analogs, which consolidate most regulatory responsibilities for the entities that generate and manage “hazardous wastes.” Wastes produced by commercial activities are subject to a wide variety of national, state and local regulatory programs, intended to minimize the risks such wastes pose to workers, the public, and the environment. In contrast, there is no comprehensive national program to regulate wastes that are hazardous because of biological properties. Instead, state and local health agencies throughout the country regulates these wastes, under a variety of names including “medical wastes,” “infectious wastes,” and “biological wastes.” Most are similar in pattern to RCRA regulation of hazardous wastes, but each has unique definitions, thresholds, and procedural requirements. If your responsibilities cover a single workplace then this fragmentation may not matter—if your medical waste compliance is governed by a single agency, you need to identify it but may not necessarily need to care whether it’s federal, state , or local. But relationships between and among regulatory programs often matter even for single sites, and become critical to a multi-site organization seeking consistency. So, how do you manage those biological wastes? State medical waste laws regulate wastes that contain bodily fluids or other by-products from medical research or medical care activities for humans, and associated wastes such as “sharps,” filters, and other equipment. Some states include certain animal remains as well. The terminology varies, as do the specific types of wastes regulated. For example, Florida regulates “biomedical waste,” including: human tissues, blood, and other bodily fluids; sharps and equipment; and solid and other wastes contaminated with “infectious” material. Pennsylvania regulates “medical wastes” and also “chemotherapeutic wastes” from cancer treatments. Generators—who often are divided into two groups: large quantity generators who generate more than defined threshold amounts in a calendar month, and small quantity generators with a smaller output of medical wastes. Transporters—who must follow DOT requirements and often additional state requirements for manifests or shipping documents, and record keeping and reporting. 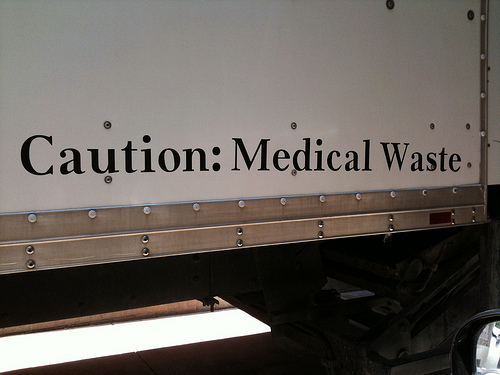 Some states (including California) allow licensed hazardous waste transporters to transport medical wastes, while other states (including New Jersey) require separate registrations. Treatment, storage and disposal (TSD) facilities—state laws typically define several types of management facilities (which can include generators or commercial facilities serving generators) based on their activities. State medical waste laws are implemented either by environmental agencies or public health agencies. Many states assign a state agency to promulgate regulatory requirements, which are implemented by local health departments. Administrative and enforcement requirements, including record keeping, inspections and fees. Worker protection and right to know. The US Occupational Safety and Health Administration (OSHA) and state worker protection agencies regulate to protect workers from exposures. In particular, the Bloodborne Pathogen Standard includes requirements for employees who handle or are exposed to medical waste. Hazardous waste. Many medical wastes are contaminated with chemicals that may render them “hazardous” for purposes of RCRA and state hazardous waste laws. Nonhazardous waste. The federal Solid Waste Disposal Act and state nonhazardous waste laws generally prohibit co-disposal of medical and solid wastes; some states provide programs to support proper management and disposal of medical wastes. Water quality. Discharges to “waters of the United States” of “infectious” wastes and medical wastes that may be contaminated with chemicals or radioactives may be regulated by EPA or state water quality agencies under the Clean Water Act (CWA) and state water quality laws. Although detailed compliance requirements depend on each facility’s activities and location, the following questions will help begin to identify these requirements. Do any of the organization’s facilities or other operations generate and/or handle wastes that may pose biological or infectious hazards? Has the organization identified the state medical waste regulatory framework(s) applicable to each such facility and operation? Other entity managing regulated wastes. Treatment, storage or disposal facility. Has the organization identified other EH&S requirements applicable to organizational facilities and operations that target management or wastes regulated under medical waste programs? Does the organization implement explicit policies and programs to ensure compliance with requirements applicable to medical wastes? Has the organization assessed the regulatory compliance status of each such facility and operation under each applicable requirement?